North Ipswich is a suburb of Ipswich, Queensland, Australia. At the 2011 census the suburb recorded a population of 4,587. The southern boundary of the suburb follows the Bremer River. The Warrego Highway passes from east to west across the northern part of the suburb. Raymonds Hill is a locality within the suburb of North Ipswich. North Ipswich is the birthplace of Queensland Rail. The original site is now the site of Riverlink shopping centre on The Terrace and the current site is used as a joint facility containing the Workshops Rail Museum. The suburb contains a large number of character and heritage listed houses, such as workers cottages that were home to the many railway workers. In November 1900, approx.150 allotments were advertised as 'Railway Workshops Estate', to be auctioned by Cameron Brothers auctioneers. James Sangster Memorial. Browns Park contains the first police monument that was funded by public subscription. The monument was erected in memory of Constable James Sangster who drowned in the Brisbane river trying to save a young family from drowning in the 1893 Brisbane floods. ^ a b Australian Bureau of Statistics (31 October 2012). "North Ipswich (State Suburb)". 2011 Census QuickStats. Retrieved 25 September 2014. ^ "Queensland Globe". State of Queensland. Retrieved 2 January 2017. ^ "Railway workshops estate : being an extension of the town of North Ipswich". State Library of Queensland. 24 November 1900. Retrieved 26 February 2019. ^ "Advertising". The Brisbane Courier. LVII, (13, 376). Queensland, Australia. 24 November 1900. p. 8. Retrieved 26 February 2019 – via National Library of Australia. ^ "Sandstone Railway Culvert (entry 602562)". Queensland Heritage Register. Queensland Heritage Council. Retrieved 9 July 2013. ^ "Remnants of Ipswich Town Wharves (entry 602567)". Queensland Heritage Register. Queensland Heritage Council. Retrieved 9 July 2013. ^ "Bremer River Rail Bridge and pylons and abutments of old bridges (entry 602568)". Queensland Heritage Register. Queensland Heritage Council. Retrieved 9 July 2013. ^ "James Sangster Memorial (entry 602581)". Queensland Heritage Register. Queensland Heritage Council. Retrieved 9 July 2013. ^ "Heiner Road Railway Overpass (entry 602467)". Queensland Heritage Register. Queensland Heritage Council. Retrieved 9 July 2013. ^ "Ipswich North State School (entry 650021)". Queensland Heritage Register. Queensland Heritage Council. Retrieved 11 February 2018. ^ "Hotel Cecil (entry 600603)". Queensland Heritage Register. Queensland Heritage Council. Retrieved 9 July 2013. ^ "Mihi Creek Complex (entry 700010)". Queensland Heritage Register. Queensland Heritage Council. Retrieved 9 July 2013. ^ "North Ipswich Railway Workshops Complex (entry 601526)". Queensland Heritage Register. Queensland Heritage Council. Retrieved 9 July 2013. ^ "Ipswich Railway Workshops War Memorial (entry 600605)". Queensland Heritage Register. Queensland Heritage Council. Retrieved 9 July 2013. ^ "Railway Historical Centre (entry 600604)". Queensland Heritage Register. Queensland Heritage Council. Retrieved 9 July 2013. ^ "Klondyke Coke Ovens (entry 602566)". Queensland Heritage Register. Queensland Heritage Council. Retrieved 9 July 2013. ^ "Queensland Woollen Manufacturing Company Ltd (former) (entry 602572)". Queensland Heritage Register. Queensland Heritage Council. Retrieved 9 July 2013. 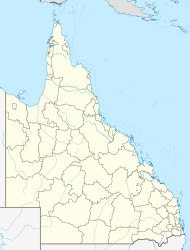 Wikimedia Commons has media related to North Ipswich, Queensland.